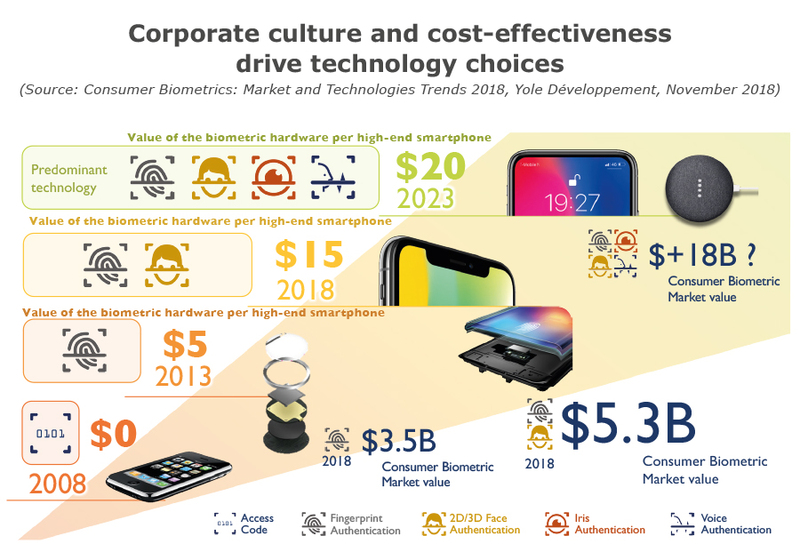 "As anticipated by Yole Développement (Yole) in mid-2016, biometry’s “second wave” began with the introduction of the iPhone X in September 2017, when Apple set the standard for technological advancement (and use-cases) for 3D sensing in consumer. Apple conceived a complex assembly of camera modules and VCSEL light sources using structured light principles, along with an innovative NIR global shutter image sensor from STMicroelectronics to perform secure 3D facial recognition. 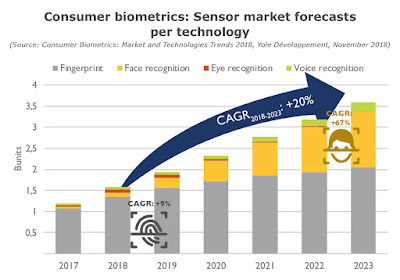 This second wave, led by biometry with 3D sensing, is ongoing and will increase market value toward $17B by 2022. 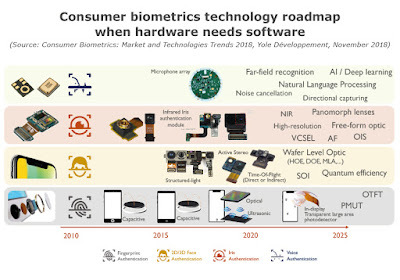 But biometry is not only a matter of fingerprint or face detection but also iris and voice recognition, regarding the overall breakdown of biometry recognition, Yole estimates that the proportion of each type of detection will be quite unbalanced in the future, with 60% of biometric module in volume coming from face recognition module, while fingerprint (40%) will see a decrease over time of its value due to competition and alternative implementation leading to cost reduction."